Over the past six months, the government has not taken effective steps to overcome the unemployment problem, although the opposition warned of the threat of deteriorating situation. Serhiy Lovochkin, deputy Chair of the Opposition bloc faction, wrote about this in his request to the Prime Minister Volodymyr Groisman. The politician demands the Cabinet to immediately take up the issue of unemployment and economic development. The MP recalled that at the beginning of April this year, in a request to the Cabinet, he emphasized the negative tendencies of deepening unemployment problems, the level of which reached the record level last year. However, during the time since then, the government has not taken effective steps to address these issues, as a result of which the situation in this area continues to worsen. “Despite the insignificant decline in the unemployment rate in the first half of this year (from 9.9% of the working population to 9.3%), it remains significantly higher than the corresponding indicator of the pre-crisis year of 2013 – 8%,” Serhiy Lovochkin said. He also cited experts’ opinion that the official figure does not allow to objectively assess the scale of unemployment in Ukraine. The sharp increase in the number of migrant workers in recent years has increased several times and has reached 4-6 million Ukrainian citizens, indicating a significant narrowing of the labor market in Ukraine. If this number of labor migrants, who could not get in Ukraine and were forced to go abroad, to add to the number of officially registered unemployed, then, according to experts, the real unemployment rate would exceed 30%. “Socially vulnerable citizens are particularly the most affected by unemployment problems. First and foremost, we are talking about young people and the elderly. This year, the unemployment rate (17.1%) among young people (15-24 years old) is almost 2 times higher than the average level in the economy. Almost a third of citizens of pre-retirement age (50-59 years old) have lost hope of finding a job and have become economically inactive,” the request says. “The insufficient efforts of the Cabinet of Ministers to stimulate the development of the economy form the preconditions for further deepening of unemployment. In particular, in the draft State Budget-2019, the government envisaged scant funding for measures to stimulate Ukrainian exports, attraction of investments and support of innovations, planned further closing of development and support projects of certain industries, including rocket and space, military-industrial complex, agro-industrial complex, coal industry, energy, scientific sphere,” Serhiy Lovochkin noted. 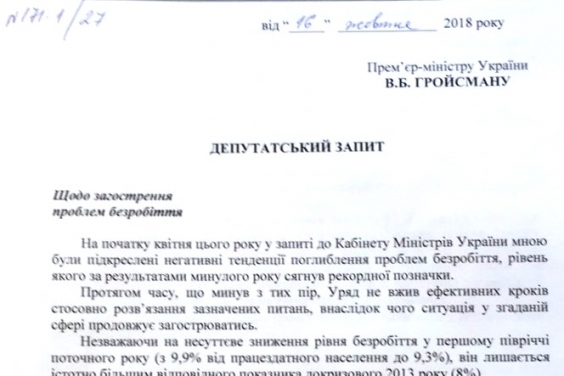 “According to the conclusions of the MP of the Opposition bloc faction, which are reflected in the proposals for the draft State Budget-2019, budget expenditures for the development of the economy next year should be increased by at least one-third – up to UAH 107.8 billion UAH,” the politician concluded.